Probably the most beautiful and fascinating city in Poland. The attraction is not just the splendid architecture and the treasures of art – reminders of the times when Krakow was a royal capital city – but also the unique ambience of the former Jewish district and the masterpieces of Polish Art Nouveau. However old and beautiful it is, Krakow is not limited to its monuments and museums. Thanks to an amazing density and variety of bars, pubs, clubs and restaurants, Krakow sparkles with life. Anyway, there is no point in merely talking about its attractions – everyone should see Krakow with their own eyes. 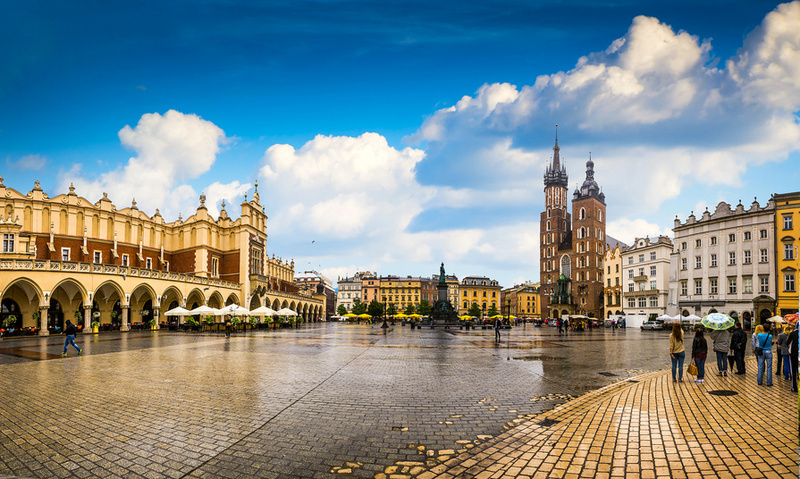 Krakow, with a population of over 755,000 people, is Poland’s second largest city. Although it ceased to be a capital city in 1596, it still plays the role of cultural centre for Poland. Fortunately, it escaped World War II with no major fighting or bombing, and it remains almost unscathed even after fifty years of communist rule while concrete blocks of flats were built outside the city centre. Krakow is also an important academic city, famed for its ancient university of consistent and continuing repute. But above all, the city is known as the most popular tourist destination in Poland, with the former royal Wawel castle being rated among its major attractions. The majority of monuments are situated in the Old Town, framed by the ring-shaped park, known as “Planty”. In the centre of the Old Town there is Europe’s largest market square, with the “Sukiennice” (the Cloth Hall) dating from the 14th century and one of the best-known landmarks of Krakow. The charming and exuberant atmosphere of the city attracts visitors in every season. Krakow is situated in a valley formed by the Vistula River. In the Middle Ages it had many branches and some areas of the city were islands, including Wawel, Skalka and Kleparz. Nowadays the river flows along one main channel and the former islands are just part of the city. The oldest part of Krakow lies on the northern (left) bank of the river. Krakow is the capital of Malopolska (Lesser Poland), a voivodship (province) of Poland that spreads out to the southern border of Poland. The region is a popular tourist destination, and along with magnificent Krakow there is also Zakopane, Wieliczka, Krynica, Niedzica, and Oswiecim to be visited. Zakopane lies in the Tatra Mountains (the highest in Poland), but there are also the Pieniny and Beskid Mountains to choose from. The first written record of Krakow was made by a Jewish merchant from Cordoba, who visited the already established city in 965. 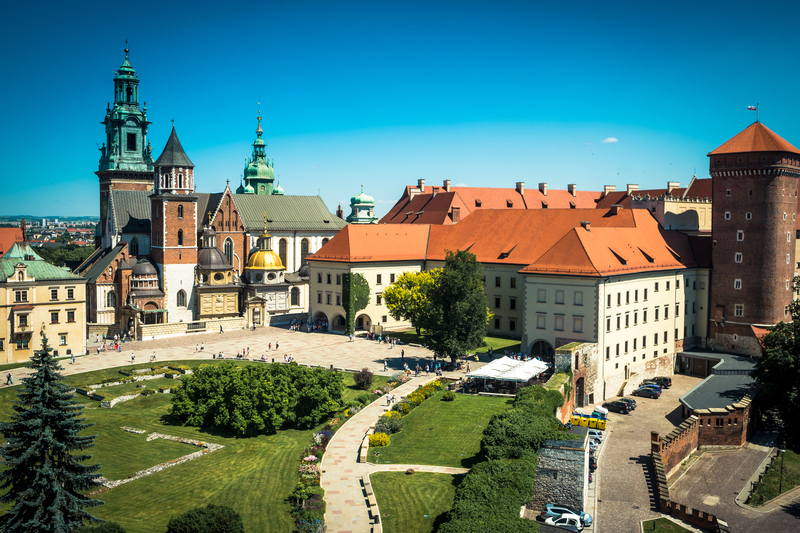 The legend is that the founder of the city was called Krak, and he ruled happily until a terrible dragon appeared and moved into the cave under the slopes of Wawel hill. The beast was eventually defeated by a clever cobbler, Szewczyk Dratewka. Today the figure of the dragon still stands in front of its cave, while a still visible mound commemorates the first ruler. The favourable position on the junction of several trade routes helped in the rapid development of the city. In 1000 Krakow became the seat of a bishopric and then in 1038 the capital of the whole country. In the 13th century, Krakow was invaded by the Tatars, who destroyed the then wooden town. It was soon rebuilt, and even today the present layout of the streets resembles that of the 13th century town. Good times for Krakow began in the 14th century during the reign of Casimir the Great, a patron of art and scholarship. 1364 saw an academy being founded in the city, the second such university in central Europe. The city enjoyed its greatest development in the 16th century, particularly under Kings Sigismund the Old and his son Sigismund August. The next centuries saw great changes – the capital was moved to Warsaw, Krakow was pillaged and twice demolished by the Swedes and then eventually this part of Poland was partitioned off as part of Austria. In comparison to the Russian and the Prussian occupation of the other parts of Poland, the Habsburg rule was the least oppressive and in 1866 the whole region gained some autonomy. The end of the 19th century was a time of cultural, intellectual and artistic development in Krakow, which became the spiritual capital of a nonexistent country. It was not coincidental that in the following century Krakow produced the Polish Legions under Pilsudski. After a short period of independence, Nazis occupied Krakow and it became the capital of the General Government. The Governor decided to arrest and deport to the death camps 183 professors of the Jagiellonian University according to Hitler’s intention to eliminate the Polish intelligentsia. A ghetto was created in the Podgorze district, later liquidated in 1943, with the surviving inhabitants being sent to the camp in Plaszow or to Auschwitz. Fortunately, the Germans did not destroy the city, so the Old Town still survives. After the war Krakow became the centre of a non-communist and Catholic movement. Even the construction of a steelworks in Nowa Huta near Krakow (today a district of the city), designed to break the religious framework of the city, did not change it. However, it had another, unforeseen effect: the pollution created by the works harmed many of Krakow’s monuments. Since 1989 Krakow has been undergoing intense renovations and is now considered to be of the most beautiful and interesting cities in Poland.